or 4. if you have any trouble at all! If you are interested in events scheduled beyond the dates here, check out the monthly calendars. You are welcome to register for classes as soon as they are posted on the calendar or you can wait until further details and registration links are listed on this Schedule of Events. One or two people can work on a single pig—how you divide or share the meat is up to you! Want a larger pig? When you register, you will have the option to order a larger pig (100 pound standard size) to yield more meat to take home. Costs: 120 pounds add $65; 140 pounds add $125; 160 pounds add $185. We're excited to offer another amazing hands-on butchering workshop where each participant will break down an entire 100-pound roaster pig. Chef Dino Bugica of Diavola Pizzeria starts the workshop with a discussion about butchering basics, including necessary equipment, safety and hygiene, knife usage, overview of primals and cuts, and other pertinent facts and advice. 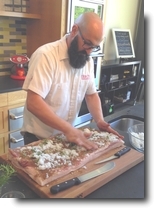 Armed with this information, each participant will move to his/her own 100-pound pig, sustainably-raised and humanely-slaughtered in Sonoma County. Guests will follow Dino’s butchering process, separating the primals, then identifying and trimming specific cuts of pork on their individual pigs. We’ll take a break mid-day for a pork-inspired lunch, delicious Diavola salumi, a hearty salad, bread, and other goodies before wrapping up all the cuts to take home. 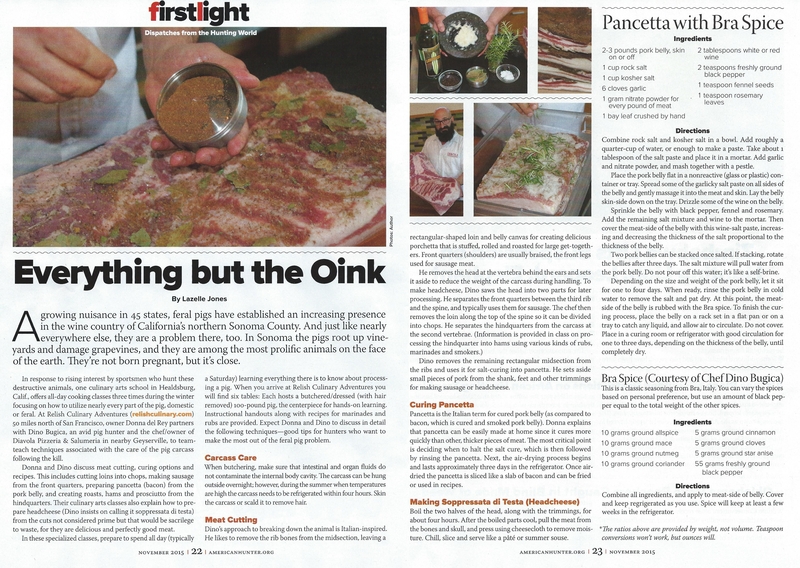 At the end of day, Dino will discuss curing and demonstrate how to make pancetta to cure at home. Each participant will take home all the cuts from their pig. Participants are asked to bring their own sharp butcher knife and a large cooler to transport the meat. Dino brings a saw and we have chef knives and cleavers for use during the class, as needed. We will provide ice for your cooler to keep the meat chilled for your drive home. This Relish class includes one glass of premium wine per person served with lunch to all participants over 21 years of age. using ingredients gathered at the market. Live like a local you shop the charming Healdsburg Farmers' Market and cook with ultra-local and seasonal wine country ingredients. Our intrepid chef-instructor for the day will lead a brief demonstration at the Farmers Market, followed by a market tour where we meet the purveyors, taste and learn about their exquisite products and explore new flavors. Guests will help select the seafood, seasonal fruits and vegetables, and artisan cheeses for the lunch menu with extra time to purchase goodies to take home. After our time at the Market, participants will walk across the street to the beautiful Relish Culinary Center for a hands-on cooking workshop, learning techniques for cooking with the just-gathered ingredients. Guests will sit to relax and savor our hearty farm-fresh lunch with specially selected local wines. This Relish class includes 2 glasses of wine (8 oz. total) per person served to all participants over 21 years of age. Additional wine is available for purchase by the glass or bottle. Israeli food is in style these days due to best-selling cookbooks by Yotam Ottolenghi and Michael Solomon. As more people learn about how Israeli cuisine melds the flavors and ingredients of Northern Africa, the Middle East and Eastern Europe, it's no surprise that it's become so popular in America. 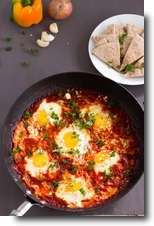 Chef Hila Fichtelberg, a native of Tel Aviv, leads this wonderful class that features traditional Israeli brunch dishes. Participants will be hands-on with all the dishes, learning techniques from chef Hila as she shares stories of growing up and learning to cook in Israel. She'll combine these classic recipes with the fresh seasonal ingredients of Sonoma County (which shares a similar Mediterranean climate and growing season.) Participants will sit and enjoy their brunch feast with specially selected wines. All proceeds for this event will be donated to the Alexander Valley School Parent Club to be used for enrichment classes and field trips for the students. join our mailing list to receive announcements about new classes.